Finally! The True 5200 project was completed with the application of one final coat, of five, of Interlux 2000E Two-Part Epoxy Barrier Coat and three coats of Pettit Hard Racing Bronze bottom paint. Communication with, actually a trip to the woodshed with Don Danenberg convinced me that our 80-grit, coarse-surface strategy leaves too many cross-grain scratches, which either remain visible beneath the varnish or require many more coats to fill and produce a truly flat surface. Yes, the Shepherd’s topsides and transom a very, very, very flat, but will the wood take filler stain? Yes. Remember that thorough bleaching is next. We will keep her exterior wet for 12 hours through repeated applications of bleach, and I mean really wet. 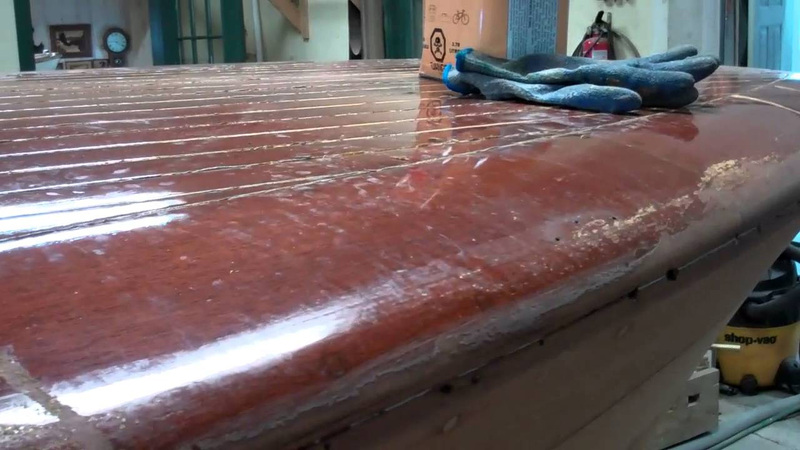 Bleaching raises grain, so once the feathers resulting therefrom have been knocked off with a quick 220 grit hand sanding, the grain will be open and stain will penetrate. But there is a milestone, well two milestones standing in the way of bleaching. The decks, covering boards and various trim elements must be stripped to bare wood, including removing all residual stain.